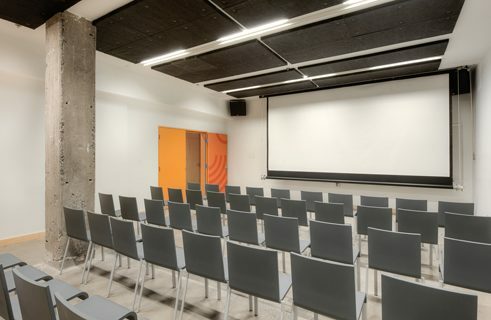 Classroom | Photo: Goethe-Institut Located in the heart of the Quartier des spectacles in Montreal, our easily accessible institute, which is certified LEED Canada Silver and has an innovative design, is the ideal place to organize your classes, seminars or professional training sessions.We have four classes available to rent, along with our multimedia projection room. All rooms are equipped with wifi internet and white smart boards. Each room can accommodate up to 20 people (dimensions : 5,7m x 7,3m / 19' x 24'). There is also a space available for meals and coffee breaks or for use by caterers. Equipped with modern equipment, the room can accommodate up to 50 people for events requiring quality projection. The room can be rented with a technician and a receptionist for the duration of your event.